Contestants Announced for the 9th KIFC! 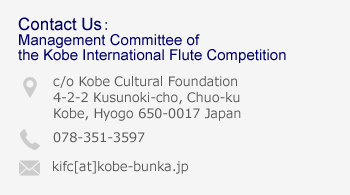 We are pleased to announce 53 contestants (from 18 countries and 1 region) invited to participate in the 9th Kobe International Flute Competition in May 2017. The preliminary screening to determine applicants advancing to the 1st Round of the competition was held from November 21st to 24th. Not only had we received a large number of applications more than we had expected (240 applications from 37 countries and 1 region), but also the overall performance level of applicants was impressively high. Though that made the selection process very difficult, we are confident that the 9th KIFC will be a good competition. Please join us in welcoming these young talented flutists who will be performing in Kobe.